Fresh, sweet corn on the cob offers multiple benefits: it's an easy-to-find whole grain that's versatile enough to eat raw or cooked, on its own or in salads and salsas. It's also an affordable choice—during summer's abundance, you can often purchase several ears for just a dollar or two. Although corn isn't often thought of as a whole grain, its kernels contain all three nutritious layers: the bran, germ, and endosperm. From them you get fiber, antioxidants, healthy fats, complex carbohydrates, and more, all important in a cholesterol-friendly diet. Enjoy these nutrients packed into this smoky, famous Mexican street snack. It offers traditional ingredients like lime, chili pepper, and cilantro, and goes a bit lighter on the cheese to keep calories and fat content in check. Soak the ears in a large bowl of cold water for up to 30 minutes. Towards the end of their soaking, prepare the herb mixture in a small bowl. Combine avocado oil, chili powder, paprika, dried parsley flakes, salt, and parmesan cheese. Stir well. Prepare the ears of corn. Remove them from the water, shaking off the excess. Remove one or two layers of the tougher outer husks, if any, leaving at least three layers on. Peel back the remaining layers just enough to reveal the silk inside. Pull the silk away using your hands or paper towel. Using a brush, spread the herb mixture evenly on all sides. Fold the husks back into place. 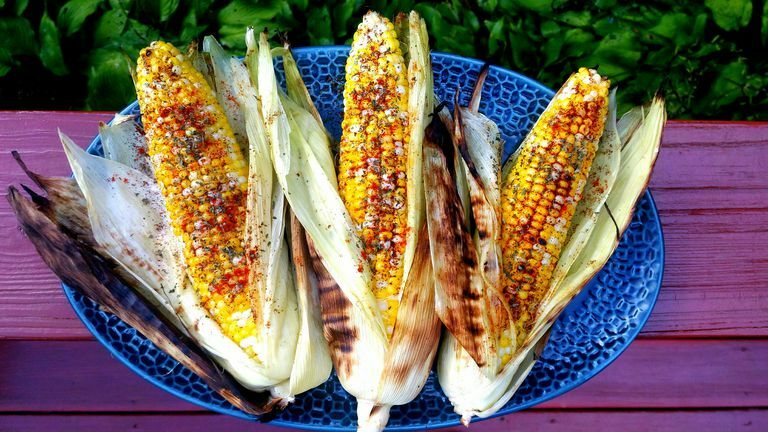 Place the corn on the grill. Grill for 20 minutes, turning the ears every five minutes, until the kernels are easily pierced with a fork or knife. Remove from grill, let cool for a few minutes, and serve with lime wedges and additional herbs and spices available for sprinkling, as desired. Since you're grilling, opt for an oil with a high smoke point, one that will fare well in the heat. Avocado oil has the highest at 520F and brings forth the nutritious fat profile that the fruit itself offers. If you don't have it handy, sunflower or grapeseed oil are good options and may be cheaper. A high quality virgin olive oil will also do. Match your ear of corn to your mood and cravings. Use any combination of herbs and spices you prefer. Turn up the heat with a dash of cayenne, or add basil and oregano flakes for a more Italian mix. A bit of curry or garam masala can add Indian flare. Don't skip out on soaking the corn, even if you're short on time. The extra moisture helps soften the husks and kernels and makes the ears easier to work with. If you can't afford the half hour, soak for at least 10 minutes. Keep the heat of the grill medium to medium high, regardless of whether you're using gas or charcoal. Avoid placing the ears directly over an open flame, as they'll catch fire. Usually 20 minutes is enough for a perfectly grilled ear, but you can keep grilling for up to 30 minutes if your ears are on the warming rack. You can easily make this recipe in the oven. Wrap the ears of corn in aluminum foil after brushing them with the oil and herb mixture. Bake at 350F for 30 to 40 minutes.